Better understanding of medical condition and infusing the same in the dental treatment by avoiding any surgical procedure. Coordinated interdisciplinary approach using slow eruption and esthetic rehabilitation. Nothing can replace the natural but the natural. Restorative dentistry holds the main aim of restoring tooth form, function, and esthetics. In clinical practice, situations come wherein tooth structure is insufficient for restoration with a definitive prosthesis. The main problem arises where margins are subgingival invading the biologic width. In such cases, periodontal tissues are to be taken care of, to prevent failures. Treatment modalities, thus, involve a multidisciplinary approach including endodontics and periodontal crown lengthening/orthodontic extrusion followed by prosthetic rehabilitation. Periodontal crown lengthening procedures involve osseous resective therapy in conjunction with appropriate soft-tissue management to expose the desired clinical crown. Orthodontic intervention, on the other hand, extrudes the tooth to expose sufficient tooth structure for rehabilitation. The main objective behind forced eruption is to provide tooth structure for sound margin placement in harmony with the biologic width. The purpose of the paper is to present a case of a medically compromised patient with mutilated anterior tooth requiring interdisciplinary approach for saving the tooth. 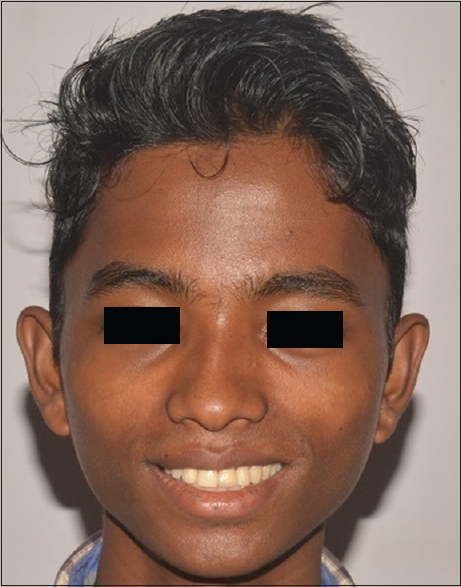 A 19-year-old boy reported in the Department of Prosthodontics, Goa Dental College and Hospital, India, with the chief complaint of fractured and discolored maxillary left central incisor. He gave a history of trauma to the same tooth followed by root canal treatment 1 year ago. An intraoral periapical of the same indicated a well-obturated tooth with good apical seal and sufficient root length. 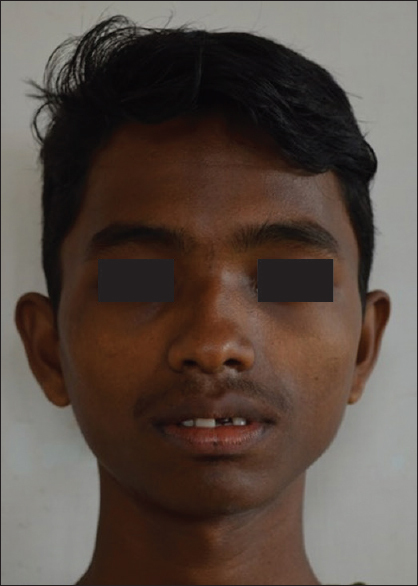 His medical record indicated the patient to be suffering from thalassemia major and was receiving blood transfusion every month in Goa Medical College and Hospital, Bambolim [Figure 1]. During tooth preparation, it was noticed that the remaining tooth structure was insufficient to place a full coverage crown. To provide a sufficient ferrule for a post and core crown, the margin had to be placed subgingival which could have encroached the biological width. Considering the medical history of the patient, a decision was made to treat it nonsurgically by forced eruption. Due to lack of sufficient tooth structure for bracket placement, the tooth was prepared to receive a customized cast post and core with a hook to engage orthodontic elastics for extrusion [Figure 2]. It was ensured to provide sufficient clearance at the incisal level of the tooth for extrusion without interference from opposing tooth. 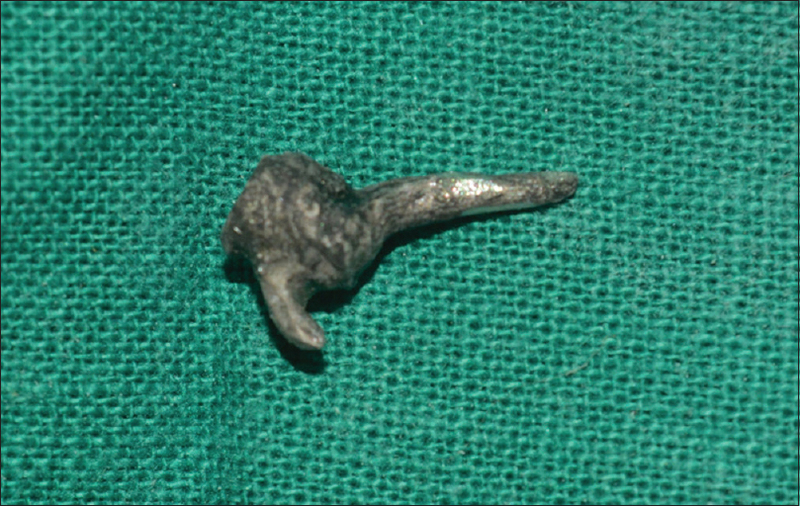 The post and core was cemented with Type I glass ionomer cement (GC Fuji I, GC America) [Figure 3]. The adjacent teeth were bonded with brackets from 13 to 23 for anchorage during the adjunctive orthodontic treatment. The teeth were aligned with 0.016 nickel–titanium followed by 17 × 25 stainless steel (SS) wire and finally 19 × 25 SS wire (3M Unitek) [Figure 4]. With the rigid final wire ligated in place, light force-generating elastics were used to extrude the tooth. The patient was instructed to use fresh elastics daily and to wear them continuously. Periodic evaluation was done every week for 1 month to remove any occlusal contacts that would impede eruption, and the movement was measured. After achieving the desired extrusion, the elastics were discontinued followed by a maintenance period of 6 weeks to allow for the reorganization of periodontal ligament. After maintenance period of extrusion was over, the brackets were debonded and the hook was trimmed using diamond abrasive points [Figure 5]. The finish lines were established for porcelain fused to metal crown in the newly achieved tooth structure, and the core was polished with ultra-low speed burs and metal polishing disks. An impression was made with polyvinyl siloxane (Elite HD+, Zhermack, Italy), and porcelain fused to metal crown was fabricated and cemented with zinc phosphate cement. The patient was reviewed periodically for 1 year, and no signs of posttreatment gingival inflammation or periodontal changes have been noticed [Figure 6]. Maintenance of periodontal health and having favorable esthetics is the ultimate goal of any restoration. Placing a restorative margin which encroaches the biologic width frequently leads to gingival inflammation, loss of clinical attachment, and bone loss. This process is attributed to the destructive inflammatory response to microbial plaque located at such depths. Thus, it is imperative to maintain health of periodontium during restoration in subgingival areas, and therefore, supra- or equi-gingival margins are preferred. The biologic width is stated to be 2.04 mm, representing the sum total of epithelial and connective tissue attachment. The biologic width can be identified in each patient through “sounding of bone,” wherein probing is done under anesthesia and sulcus depth is subtracted. The information obtained can be used to diagnose the violation of biologic width and further corrections as required could be done. In the present case, as the clinical tooth height was insufficient, forced eruption was carried out to expose more tooth structure. This provided ferrule for the crown, thereby improving the resistance and retention form for the prosthesis. Orthodontic extrusion was employed to avoid surgical procedure in a medically compromised patient. Forces of 15 g for the fine root of a lower incisor and 60 g for a molar are stated to be sufficient for slow extrusion. Some authors recommend that the maximum force should not exceed 30 g for a slow movement and 50 g for rapid extrusions.,, In the present case, a slow movement using light force-generating elastics of 20 g was used for extrusion. The patient was suffering from thalassemia major. This was confirmed by his blood reports stating low Hb %, frequent blood transfusions, chelation therapy, and yellowish discoloration of eyes. Any invasive procedures in these patients should be taken with caution. Orthodontic forces used in thalassemic patients should be of low range and follow-up appointments being kept at shorter intervals. The cast post and core fabricated in the case was customized which facilitates extrusion initially followed by its use in definitive restoration. The advantages offered by this technique include easy removal of the hook following extrusion leaving the post behind and forced eruption in cases with inadequate tooth structure to place brackets, amount of eruption can be gauged, and it is helpful for patients unfit for surgical procedures. The disadvantage was unequal gingival zenith with respect to the central incisors following forced eruption. However, it was maintained as such owing to average lip line and medical condition of the patient. Orthodontic extrusion, being a conservative procedure, allows retention of a tooth without the loss of bone or periodontal support as seen with extractions or surgical crown lengthening. This simple technique of multidisciplinary approach is preferred to salvage a natural tooth and its supporting structures in an esthetically important area without any surgical procedure involvement. Mittal R, Gupta S, Singla A, Gupta A. Managing sub-gingival fracture by multi-disciplinary approach: Endodontics-forced orthodontic extrusion and prosthetic rehabilitation. Saudi Endod J 2013;3:82-6. Sirisha K, Shankar YR, Yalavarthy NS, Suneetha K. Management of crown root fractures: A novel technique with multidisciplinary approach. J NTR Univ Health Sci 2013;2:72-7. Kang SH, Ha JH, Jin MU, Kim SK, Kim YK. Esthetic enhancement of a traumatized anterior tooth with a combination of forced eruption and tooth alignment: A case report. Restor Dent Endod 2016;41:210-7. Ansar J, Jain P, Bhattacharya P, Agarwal DK. 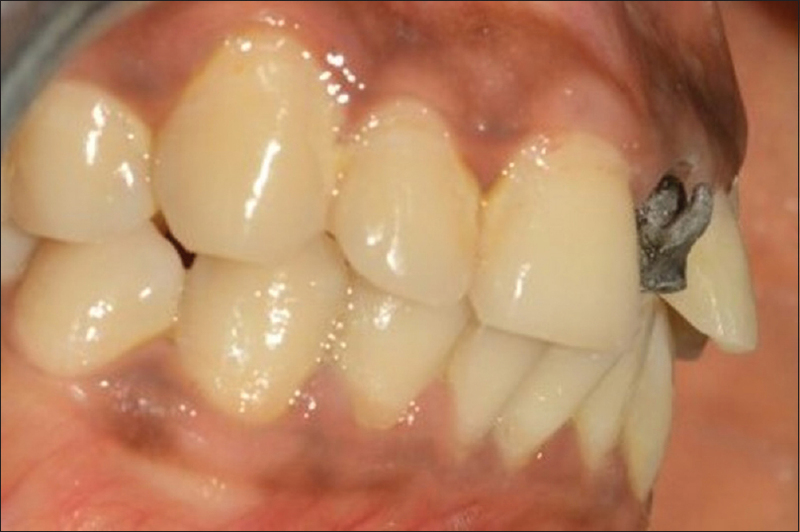 Aesthetic rehabilitation of subgingival fractures with forced eruption: Case reports. J Clin Diagn Res 2015;9:ZD13-5. Bajaj P, Chordiya R, Rudagi K, Patil N. Multidisciplinary approach to the management of complicated crown-root fracture: A case report. J Int Oral Health 2015;7:88-91. Gargiulo AW, Wentz F, Orban B. Dimensions and relations of the dentogingival junction in humans. J Periodontol 1961;32:261-7. Minsk L. Orthodontic tooth extrusion as an adjunct to periodontal therapy. Compend Contin Educ Dent 2000;21:768-70, 772, 774. Reitan K. Clinical and histological observations on tooth movement during and after orthodontic treatment. Am J Orthod 1967;53:721-45. Bondemark L, Kurol J, Hallonsten AL, Andreason JO. Attractive magnets for orthodontic extrusion of crown root fractured teeth. Am J Orthod Dentofacial Orthop 1997;112:187-93. Madhok S, Madhok S. Dental considerations in thalassemic patients. IOSR J Dent Med Sci 2014;1:57-62.